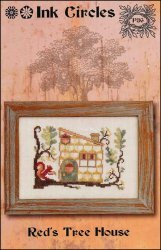 Red's Tree House [H1185] - $8.00 : Yarn Tree, Your wholesale source for cross stitch supplies. Cross stitch pattern by Ink Circles. What child wouldn't want to hangout in this tree house?! This nice & cozy tree house sits on a tree branch with a squirrel munching on a nut. Stitch count 80w x 53h.